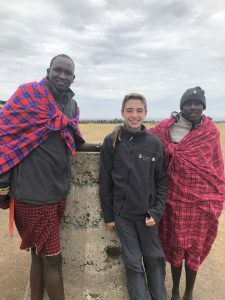 I hadn’t been to Kenya for quite some years, and I have to say that I was blown away, not only by the properties I visited but the people I met along the way. It was also extra-special taking my son and seeing everything through his eyes. Our first night was spent at The Boma in Nairobi, a new and very nice hotel. A unique feature is that each room has a telephone you can use to call the US free of charge; great for quickly letting folks back home know you’ve arrived. We had dinner in the casual bistro but there’s also a more formal restaurant. 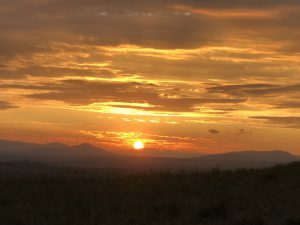 The next day, we were up at dawn to catch our flight to Amboseli National Park. After a quick flight from Wilson Airport we were on our way to Tawi Lodge, and our transfer was like a mini-game drive in itself! 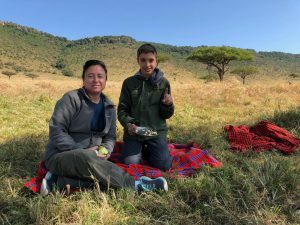 The lodge is on a private conservancy but also has easy access in and out of the park, and there are many other activities on offer such as camel back safaris, walks and cultural visits. The game viewing was great but you do see other vehicles as you’re in a national park. Rooms are stand-alone thatch villas and our triple had both a shower and a bath and three single beds. 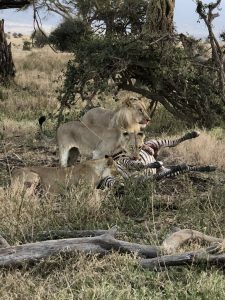 The next day we transferred to Tortilis Camp, which is on the other side of Amboseli and much quieter, situated in its own conservancy. 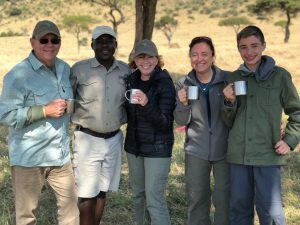 This is a very popular camp with our clients and we loved it too – we had a close encounter with an elephant that I’m sure Jake will never forget! Amboseli is famous for its elephant population and the views to Mount Kilimanjaro, and delivered on both counts – we even saw the top of Kilimanjaro as it was a clear day – but what surprised me was that there was an abundance of wildlife too, including a lot of flamingos. The rooms and swimming pool are a little bit of a hike down a hill, although you can get a ride if you need to. The family rooms are not inter-leading, but are very close together and connected by walkways. From here, we flew to Lewa and then transferred to Kifaru House. 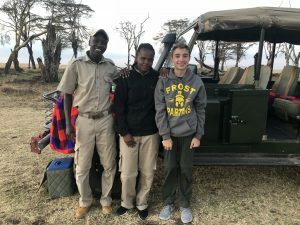 We had great wildlife sightings here and our guide Solomon and trainee guide Janet were incredible – not only were they knowledgeable, but they were really interactive, especially with Jake. We had some great rhino sightings ­– the rhino conservation program here is a big draw for our clients. We stayed in a large, standalone family unit; again, they are not inter-leading but next to each other. The grounds are spectacular with wonderful settings for lunch even at the pool… this lodge is a great option for groups or families traveling together! Lewa Conservancy offers many wonderful activities from horseback riding, camel safaris, cultural visits, night drives and the option of doing a full day at Ndare Forest with walks to the waterfalls and along the canopies – plenty of alternatives to game drives which is great if you have younger kids or active adults. 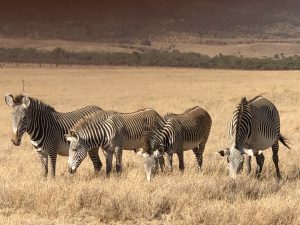 This area is also well known for seeing Grévy’s zebras, which you don’t see in other areas, and the Reticulated giraffe. The next day we went to Lewa Safari Camp. There were several highlights, the first when a male rhino followed us all the way back to camp after mock charging us – he was staking his territory! Another was having breakfast and lunch by the pool and watching the amazing birdlife. We also had the opportunity to spend some quality time with a cheetah before watching a lion kill – a first for Jake! We then flew to Elephant Pepper Camp in the Mara. It’s a tented experience with incredibly spacious rooms and large en suite bathrooms with two sinks, always a plus point with me! You can horseback ride here, do a nature walk around the camp or a walking safari, plus hot air ballooning takes place about an hour away. Another nice touch is that guests are invited to plant their own elephant pepper tree free of charge – each one has a plaque with your name and you can check in on its progress on future visits. We were also offered a back of house tour. The whole place is very eco-friendly, with an amazing vegetable garden, and ‘charcoal fridges’ to keep fruit and veg cool. They also make their own honey, and can prepare food in a kosher kitchen without any fuss. We went on a night drive and saw a serval (wild cat), spring hares and a lot of hippos. The camp is very involved with a local school which you can visit too. Another unique touch is that the manager Alison has created a flip folder of all the cats you may come across – identified by their facial markings – with information such as their name, how old they are, what pride they belong to etc. From here we drove to Kichwa Tembo along terribly bumpy roads, although you do get to pass villages and see a bit of the local community. Kichwa Tembo is a larger camp, which is perfect for large groups who want to travel together but don’t want to take sole use of a camp. It’s modern, and the brand-new superior rooms are beautiful. All meals are buffet style, and the service was amazing. After this, we transferred to the Sand River Mara, which takes about 1.5 hours. This is a beautiful camp set along the Sand River which has tented rooms with outdoor showers. Breakfast and lunch are usually served at a scenic spot in front of the main area along the river. We finally got to see a leopard here… and in actual fact we got lucky and saw two, which is what Jake had hoped for! That evening it rained so we headed back to camp and decided to have a quick dinner before heading to bed. 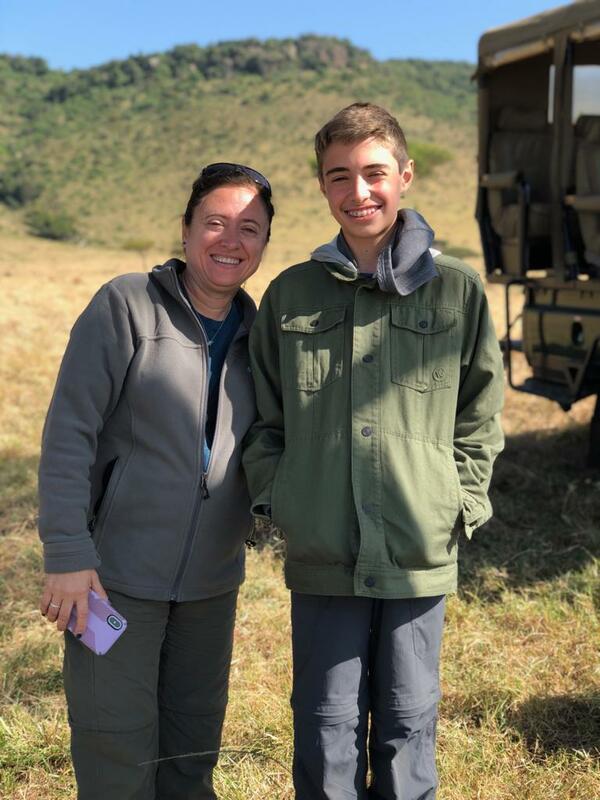 There was a bit of commotion in the dining area as we started dinner due to a very rare sighting of a pangolin, who had come through the camp… I have been on many safaris and have never seen one, and what a sighting… Jake might be my good luck charm. There is less wildlife here than in the Mara, but you usually have one-on-one sightings, and there’s the option of taking a day trip to the Mara River where you’ll see hippos and crocs. Sand River Mara also has a more intimate camp for exclusive use called Little Sand River. Next was Sala’s Camp. We were collected by Daniel our guide and Ben the spotter/tracker, and not five minutes after we left Ben found a lioness and then her cubs with a fresh kill (we didn’t see the actual kill), so we spent the morning watching the pride of lions interact and make their way to the river just downstream from Sand River Camp. What an experience… what I love about this area is that you seem to get more one-on-one sightings with few vehicles. Sala’s Camp is also along the Mara River but is very intimate, with only seven tents. It’s very kid friendly, with a special menu for children and a firepit where you can make s’mores, and the guides can do many activities with the kids such as showing them how to track wildlife and learning about the wildlife. We also visited the spot where Kenya and Tanzania meet and I have a picture of us on each side with some Masaai guides. We rounded off our trip with two nights at The Ocean Spa Lodge near Msambweni, about 45 minutes South of Ukunda Airstrip and Diani Beach. The aim of the lodge is to have the same all-inclusive, intimate feel of a safari lodge but by the beach. We had a family villa with two bedrooms, each with an en suite bathroom, as well as a lounge and dining area. There was air con but also big windows that let in the sea breeze. The beach was quiet, with only a few fishermen. The food was amazing. There was of course great seafood, but plenty of other options too, with three courses for lunch and dinner. There was a huge swimming pool and smaller paddling pool, beautiful grounds and a spectacular spa where I indulged in a couple of (reasonably priced) treatments using Italian products. You can go snorkeling or go on a river cruise, but we opted to stay put. In fact, I’d really recommend this hotel as a honeymoon destination where you can be pampered, relax by the pool or on the beach, and eat well. It would also be a good option for multi-generational travel. We then headed back to Nairobi to get our flight home. We visited the Giraffe Centre and then to see the orphan elephants we had fostered at the David Sheldrick Wildife Trust. This was incredible, especially for Jake – the interaction you get to have with the babies was wonderful. We’d booked a day room at the House of Waine so we could go back and shower before our flight home. And then, sadly, it was time to go home!